Come play on the ropes with Cindy! You’ll experience a deeper understanding of various poses, from backbends to forward bends, twists and inversions. Safely supported by the traction of the ropes, you can stretch and strengthen the spine, extend the muscles, and increase joint mobility. You can remain in poses for sustained periods of time, which improves circulation and enhances relaxation and equanimity. Inversions such as headstand are accessible, without any weight resting on the crown of the head. The ropes give us courage to try new things. It’s just so much fun! This workshop is appropriate for ongoing yoga students, but not for brand new beginners. 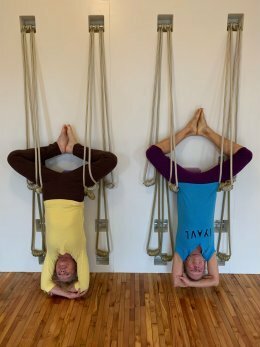 To register, visit Iyengar Yoga Asheville.